Henry Holt | Shelf Elf: read, write, rave. The Monster Returns is a sweet little ode to creativity and friendship, with monsters. This time around, Peter McCarty brings back Jeremy’s blue monster buddy from Jeremy Draws a Monster. At the beginning of the story, the Monster calls Jeremy from a phone booth to let his pal know that he’s back, and he’s bored. Bored could be a problem. Generally, you never want a monster to be bored. This is common knowledge. If you remember the action in McCarty’s first Jeremy story, you’ll recall how demanding the monster was. So this time, Jeremy is going to be prepared. He thinks fast, inviting a crowd of neighborhood kids to come up to his apartment and help him out. He gives each one a fancy pen and they all draw their own monsters to surprise Jeremy’s monster. “Friends for me?” says Jeremy’s monster, when he sees the others, and all is well. 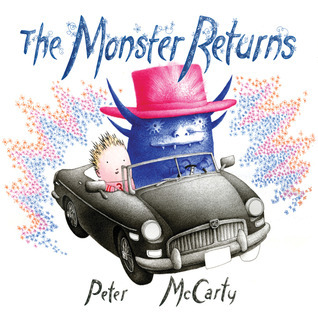 Peter McCarty’s art is subtle and whimsical, with fine lines and plenty of white background space for the huge, colourful monsters to stand out against. Plus, Jeremy’s monsters pink hat is smashing. I love the kooky end pages, and I’m sure kids will too. The Monster Returns is published by Henry Holt. This entry was posted in Art, Illustration, Picture Books and tagged 30 Picture Books, cute monsters, drawing, Henry Holt, Peter McCarty on September 23, 2012 by shelfelf.